Today’s post is about Responsive WordPress Themes, I know you heard a lot of this in the internet and to other blog. 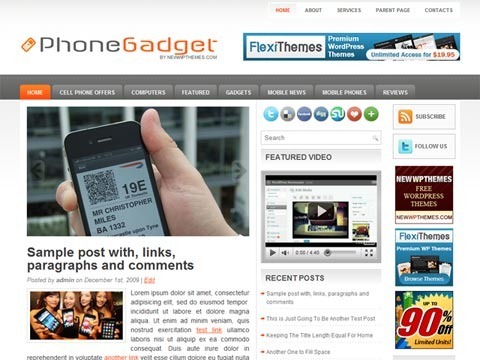 This kind of themes is one of the latest and flexible viewing experience of your blog or website. We all know that technologies this days is so advance that even a small devices can do a job same to our desktop computer. Many people used their mobile phones to browse from the internet and we want our blog/website to fit with their mobile phone regarding how small the screen is. That’s the time Responsive Web Design is born. It help as to easily rendered our website to smaller screen for easy reading,navigating,scrolling,panning and resizing. WordPress is one of the best content management system, and for blogger platform. WordPress platform is very popular now a day because of lots of functionality and many resources around the internet. As a blogger, we want our wordpress blogs to be unique to other website specially in wordpress themes. So if you have knowledge in designing and creating themes in wordpress you can try it OR if you want a FREE PREMIUM WORDPRESS THEMES then i collected it for you the latest templates for April 2011. This is free to used for your blog. So have fun downloading all the themes. Lined is a free news WordPress theme with featured content option and options page. Supports post thumbnails. Suitable for any niche, especially for news or magazine sites. Hubs is a free news WordPress theme with featured content option and options page. Supports post thumbnails. Suitable for any niche, especially for news or magazine sites. Cantare is a free WordPress theme with featured content option and supports the post thumbnails. Suitable for any niche. Theme Options at admin panel. MusicNation is a free news WordPress theme with featured content option and options page. Supports post thumbnails. Suitable for any niche, especially for news or magazine sites.